Spring makes our hearts sinnnnnnng. The birds, the weather its all so joyful. We partnered up with one of our favorite brands, Tea Collection to share a $25 off $50 coupon for new customers! You can see our early spring post with Tea HERE. They've since launched some new designs from their travels to Australia and of course they are every bit lovely and functional. Olive wore the Goolwa Flutter Baby Dress to the park with my mom the other day and made sure to stop and smell all the flowers along the way. Dresses never hold us back, she climbs and slides and twirls her way through the park. 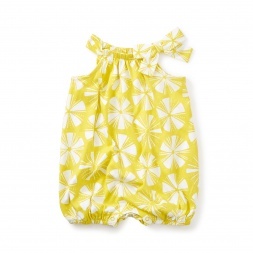 She's also wearing the Birdsville Romper in the photos above while we played outside and around the house. One thing I love about Tea Collection is that their clothes don't compromise play with style. Their patterns are bright and fun like children's clothes should be, but also totally meant for play. Here's a few things I have my eyes on! You can click below to claim the coupon! Or enter "KOLEIMPRESSIONS" at checkout. Enter code KOLEIMPRESSIONS to receive $25 off your order of $50+ on full-priced styles at teacollection.com. Valid for new customers only. Offer valid through 4/24/2017 at 11:59 PM PT. Does not include Patagonia, saltwater or Livie & Luca. Discount taken will be pre-tax. No adjustments on previous purchases. Not redeemable for cash. Cannot be used towards the purchase of gift cards. Limited to stock on hand.